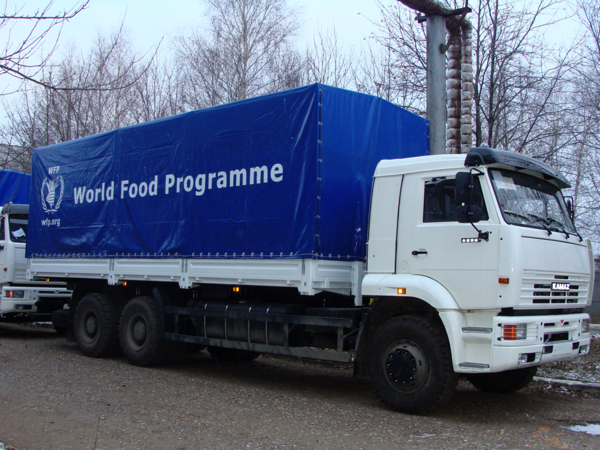 Today, the first batch of KAMAZ vehicles was transferred to the UN’s World Food Program Fund at the ceremony in Moscow. The vehicles are part of a UN project to refurbish the fleet used to transport humanitarian aid. Ertharin Cousin, Executive Director of the UN World Food Program, as well as the heads of the Russian Emergencies Ministry, Russian Foreign Affairs Ministry, Russian Finance Ministry, and other departments took part in the transfer of endowment documents with the ceremonial key. Fifteen cars will be sent to the St. Petersburg port for further shipment to Ghana. As may be recalled, at the beginning of the year, the Russian government signed a decree supporting the implementation of the UN project to refurbish the fleet of vehicles for humanitarian aid delivery. The document authorized the purchase of KAMAZ vehicles as an in-kind contribution of the Russian Federation to the UN World Food Program. The federal budget allocated more than 720 million rubles for this purpose. Of the 218 trucks KAMAZ is expected to produce, 130 will be delivered by the end of the year, with 32 trucks going to Ghana, 15 to Uganda, 52 to South Sudan, and 31 to Afghanistan. 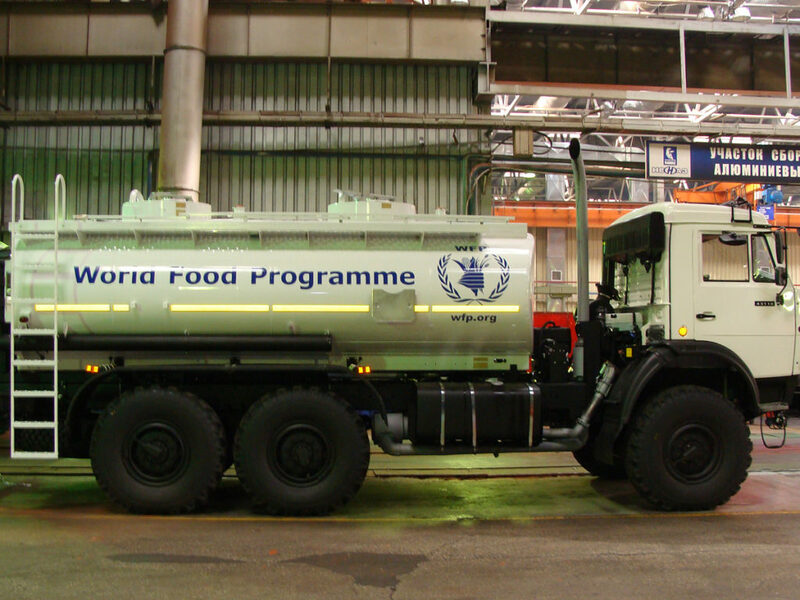 The UN World Food Program will receive the remaining 88 KAMAZ trucks next year. KAMAZ has long partnered with the United Nations. In 2012, the Russian government donated over 40 KAMAZ vehicles to the World Food Program in Afghanistan to support food delivery operations in remote areas of the country. According to Louis Imbleau, Director of the World Food Program in Afghanistan, such technical support is a key to ensuring the timely delivery of food aid to the starving people of Afghanistan. “The new KAMAZ trucks, which are much more economical and easier to maintain, are replacing the World Food Program’s existing fleet of vehicles, which have been worn out for a long time,” Imbleau said. KAMAZ is Russia’s largest manufacturer of commercial trucks, overseeing more than 150 organizations in Russia, the CIS, and other countries, including 12 major automotive manufacturing plants. KAMAZ has assembly plants in Vietnam, Iran, India, Kazakhstan, and Pakistan and employs more than 59,000 people.